British ghostwriter Moore traces the lives of more than a dozen American women who were employed as luminous watch-dial painters as early as 1917. She tells how these women, some barely in their 20s, were enchanted by high pay and the allure of the paint’s luminescent substance: radium. Carefully researched, the work will stun readers with its descriptions of the glittering artisans who, oblivious to health dangers, twirled camel-hair brushes to fine points using their mouths, a technique called lip-pointing. By the end of 1918, one out of six American soldiers owned a luminous watch, but the women had begun losing their teeth and entire pieces of their jaws. Moore describes the gruesome effects of radiation exposure on these women’s bodies, and she spares nothing in relaying the intense emotional suffering of their friends and families during subsequent medical investigations and court battles. In giving voice to so many victims, Moore overburdens the story line, which culminates with a 1938 headline trial during which a former employee of the Radium Dial Company collapsed on the stand and had to testify from bed. Moore details what was a “ground-breaking, law-changing, and life-saving accomplishment” for worker’s rights; it lends an emotionally charged ending to a long, sad book. Booklist-STARRED review "This timely book celebrates the strength of a group of women, whose determination to fight improved both labor laws and scientific knowledge of radium poisoning. Written in a highly readable, narrative style, Moore's chronicle of these inspirational women's lives is sure to provoke discussion-and outrage-in book groups." STARRED Library Journal "Moore's well-researched narrative is written with clarity and a sympathetic voice that brings these figures and their struggles to life...a must-read for anyone interested in American and women's history, as well as topics of law, health, and industrial safety." Publishers Weekly "Carefully researched, the work will stun readers with its descriptions of the glittering artisans who, oblivious to health dangers, twirled camel-hair brushes to fine points using their mouths, a technique called lip-pointing...Moore details what was a 'ground-breaking, law-changing, and life-saving accomplishment' for worker's rights." Megan Marshall, Pulitzer Prize-winning author of Margaret Fuller: A New American Life and Elizabeth Bishop: A Miracle for Breakfast "Like Da a Sobel's The Glass Universe and Margot Lee Shetterly's Hidden Figures, Kate Moore's The Radium Girls tells the story of a cohort of women who made history by entering the workforce at the dawn of a new scientific era. 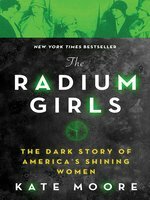 But the young women—many of them just teenagers—who learned the skill of painting glow-in-the-dark numbers on clock faces and aeronautical gauges early in the twentieth century paid a stiff price for their part in this breakthrough involving the deadly element, radium. Moore sheds new light on a dark chapter in American labor history; the "Radium Girls," martyrs to an unholy alliance of commerce and science, live again in her telling"
Nathalia Holt, New York Times bestselling author of Rise of the Rocket Girls: The Women Who Propelled Us From Missiles to the Moon to Mars "Kate Moore vividly depicts the female factory workers whose courage led to a revolution in industrial safety standards. In describing their heart wrenching struggles and bittersweet triumphs, Moore delivers an intimate portrait of these pioneers. Uplifting and beautifully written, The Radium Girls is a tribute to the strength of women everywhere." Rinker Buck, author of The Oregon Trail: A New American Journey and Flight of Passage "Kate Moore's gripping narrative about the betrayal of the radium girls-gracefully told and exhaustively researched-makes this a nonfiction classic. I particularly admire Moore's compassion for her subjects and her story-telling prowess, which brings alive a shameful era in America's industrial history." Sunday Times "...[A] fascinating social history  one that significantly reflects on the class and gender of those involved  [is] Catherine Cookson meets Mad Men...The importance of the brave and blighted dial-painters cannot be overstated."